Home/Animals and Sound/Sound Reception/How do sea turtles hear? 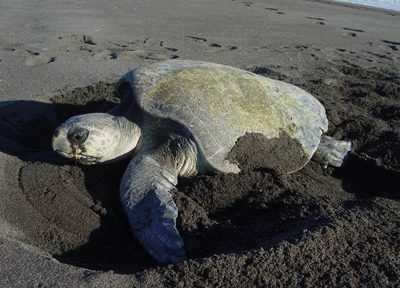 Like all turtles, sea turtles lay eggs on land. Mating takes place at sea, but female sea turtles must come onshore to lay their eggs. Most females go back to the same beach each year, usually returning to natal beaches where they were hatched themselves. 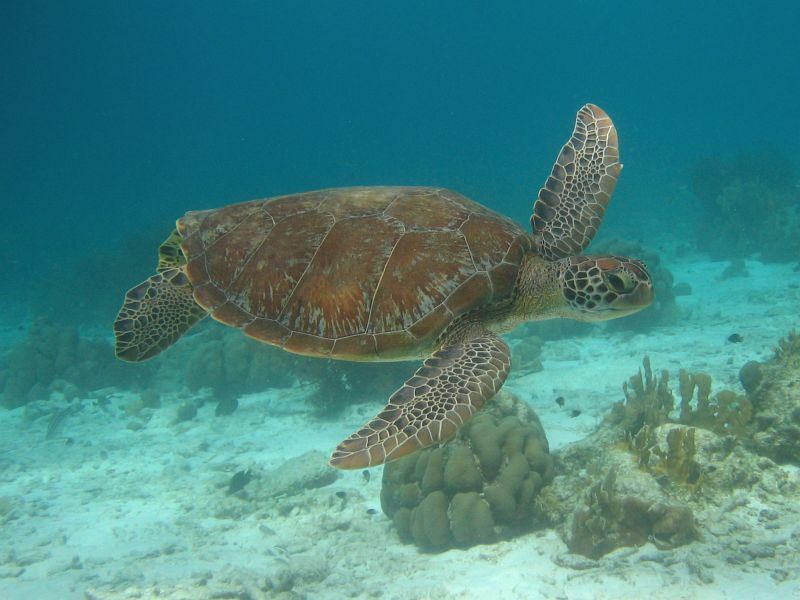 Sea turtle nesting is the only period during which sea turtle vocalization has been documented (turtles are considered the least vocal of all living reptiles). The process is physically exhausting, and sounds generated by the sea turtle are a result of breathing, pumping sounds from the turtle’s throat, and grunting. The eggs incubate in nests in the sand for roughly two months, after which they hatch en masse, usually at night, and the hatchlings will then make their way to the ocean. There is evidence that light plays a role in their ability to locate the ocean, however it is uncertain if other sensory cues also play a role. Our best data regarding sea turtle hearing come from studies using auditory brainstem responses (ABRs). From this work, scientists do know that sea turtles can hear low to mid-frequency sounds, but with poorer sensitivity than mammals. 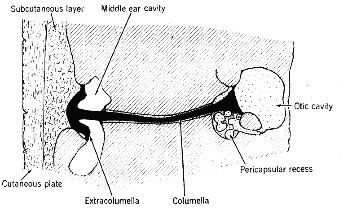 The auditory mechanism for the Green Sea Turtle (Chelonia mydas) showing the thick outer skin and fatty under-layer. From Ridgway et. al (1969). Most scientists recognize seven sea turtle species: the green turtle (Chelonia mydas), flatback (Natator depressus), loggerhead (Caretta caretta), hawksbill (Eretmochelys imbricate), olive ridley (Lepidochelys olivacea), Kemp’s ridley (Lepidochelys kempi) and leatherback (Dermochelys coriacea). Six of these species can be found in U.S. waters (green, loggerhead, hawksbill, olive ridley, Kemp’s ridley, and leatherback), and all are listed as either threatened or endangered under the Endangered Species Act. The green sea turtle, Chelonia mydas . Photo courtesy of R.P. Van Dam. University of North Carolina (Chapel Hill), Orientation and Navigation of Sea Turtles. Woods Hole Oceanographic Institution Computerized Scanning and Imaging Facility, Sample Images and Movies. U.S. Fish & Wildlife Service, North Florida Field Office, Sea Turtle Information. Ketten, D. R., & Bartol, S. M. (2005). 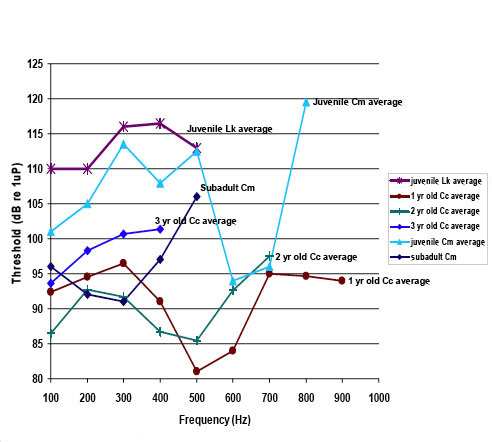 Functional Measures of Sea Turtle Hearing. Woods Hole Oceanographic Institution: ONR Award No: N00014-02-1-0510. Lenhardt, M., Moein, S., & Musick, J. (1996). A Method for Determining Hearing Thresholds in Marine Turtles (Proceedings of the Fifteenth Annual Workshop on Sea Turtle Biology and Conservation, NOAA Technical Memorandum NMFS-SEFSC-387). Lutz, P. L., Musick, J. A., & Wyneken, J. (Eds.). (1996). The biology of sea turtles. Boca Raton, Fla: CRC Press. National Research Council. (1990). Decline of the Sea Turtles; Causes and Prevention. Washington, D.C.: The National Academies Press. Ridgway, S. H., Wever, E. G., McCormick, J. G., Palin, J., & Anderson, J. H. (1969). Hearing in the giant sea turtle, Chelonia mydas. Proceedings of the National Academy of Sciences, 64(3), 884–890.